The Alpine Loop is a stunning stretch of road that leads the excited adventurer to dozens of trails, viewpoints, and campgrounds behind the majestic Mount Timpanogos in Utah County. This area is famous for its spectacular display of colors when the leaves begin to change in the fall, making it the perfect place to take a joyride through some of the prettiest mountain scenery in the state! Driving the scenic Alpine Loop can be done in an hour or so, but what’s the rush?! Pull over and snap a beautiful picture of a golden stand of aspens and plan to enjoy an amazing hike through the foliage. I have provided some of my favorite stops along the way, but there are numerous picnic areas, a picturesque reservoir, Robert Redford’s famous Sundance Resort, and a National Monument in the area as well. There truly is something here for everyone! This road is a narrow, winding canyon road with plenty of blind curves and no center dividing lines. The shoulders (if there are any) are usually slightly eroded. Steep cliffs line the Alpine Loop in a few areas. You will often share the road with bicyclists, motorcycles, and large pickup trucks so please exercise caution and don’t plan on getting anywhere fast! An entrance fee is required and more information can be found here. The road is not open year-round. Because of the narrow and winding road, no vehicles/trailers longer than 30 feet are permitted along the Loop. Due to the elevation, the peak of the colors can be hard to time. These pictures were taken on September 20. Many of the trees were already bare and some trees had not even begun changing. The Alpine Loop is incredibly busy on weekends and evenings during the autumn season, so I recommend driving the route on a weekday if possible. Now it’s time to sit back, relax, and enjoy this photo tour of the scenic Alpine Loop! We like to start at the entrance of American Fork Canyon and gaze out the windows as our car climbs higher and higher through the trees. The mountain views along the Alpine Loop are unparalleled and the steep canyon walls create a dramatic backdrop for the reds and oranges that develop along the cliffs. Stop at the Pine Hollow Trailhead for sweeping views of the colorful canyon. Aspens glowing a vibrant yellow gold are the most prevalent feature you will see along the Alpine Loop. Often a glimpse of the surrounding mountain peaks can be seen through the stunning and colorful leaves. Several small pullouts exist along the Alpine Loop and offer breathtaking views of the fall colors along the way. Look at that stand of gorgeous aspens on the mountainside! For this particular year, many of the trees had already dropped their leaves by the time we made our annual drive. Although the colors were still quite pretty, expect some trees to be completely bare…even around the end of September! The Summit Trailhead is also a great place to pull off for some amazing pictures of the changing leaves with the mountains in the background. If you have time, consider a hike along the Horse Flat Trail to reach these sensational views of the Primrose Cirque. The aspen trees near the summit provided an impressive display of color glistening in the sun. After passing the Summit Trailhead, the Alpine Loop road begins to descend into the valley behind Mount Timpanogos and the views of the mountain are breathtaking. Along this stretch of road, you will also begin to see more reds and oranges mixed in with the yellow of the aspens. Consider taking the side trip to Cascade Springs from here and enjoy a short walk around the beautiful ponds. The hike to Stewart Falls is a great way to see the best of the area! Beautiful views of the trees and mountains lead you to a dramatic and picturesque waterfall in the heart of the Timpanogos Wilderness. 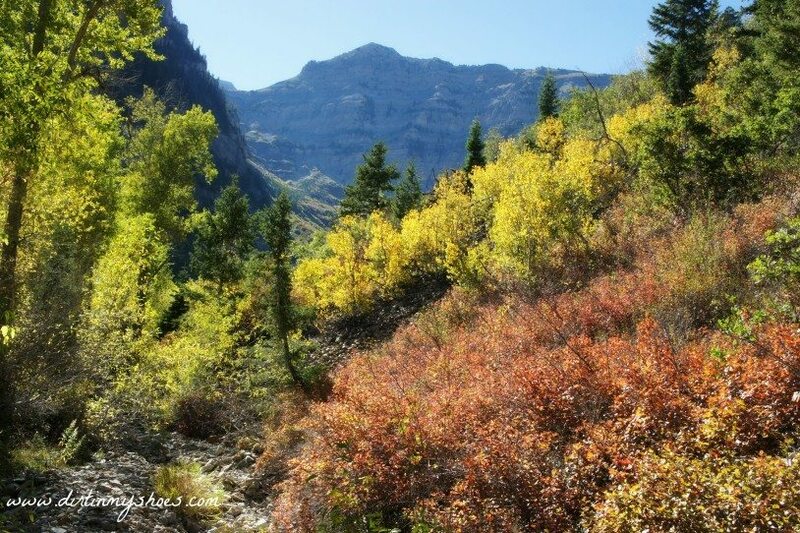 From the same trailhead, you can also make the long trek to the top of Mount Timpanogos. This trail is not for the faint of heart, but it provides incredible views of the valley and is a great (and brag-worthy) hiking option during the fall! Continuing on, the many groves of dynamic aspen trees dot the Alpine Loop as it winds through the famous Sundance area. Catch a glimpse of the backside of Mount Timpanogos and the stunning display of colors one last time before joining up with the main highway that runs through Provo Canyon. Plan about an hour to an hour and a half to see the whole road including several stops at the pullouts or viewpoints. Enjoy your drive along Utah County’s scenic Alpine Loop! To access the Alpine Loop through American Fork Canyon: From Salt Lake City, take I-15 South to Exit 284, which is the Alpine Highway/UT 92. Continue on this road for several miles until you reach the mouth of American Fork Canyon. Pass the fee booth and continue straight up the canyon. To access the Alpine Loop through Provo Canyon: From Salt Lake City, take I-15 South to Exit 272, which is 800 North in Orem. Head east for 3.5 miles until you reach the mouth of Provo Canyon, going left to enter the canyon. Continue up Provo Canyon for approximately 7 miles until you reach the turnoff for the Sundance Ski Resort. You want to be on the road that takes you to the ski resort. Travel this road for about 5 miles (past Sundance) and up the hill until you reach Aspen Grove. Drive past Aspen Grove and pass through the fee area to enter the Alpine Loop. Have you driven the Alpine Loop? Do you have a favorite place to see autumn leaves? Let me know in the comments below! When is most peak week of the October can see fall colors? Usually early October is a good time. I’ve found that if I wait too long into October a lot of the color is already gone! They used to have phone number you can call, but I couldn’t find it this year 🙁 However, I drove the Alpine Loop and the Nebo Loop this week and they were STUNNING!!! The Nebo Loop especially….I would do that one first. It was some of the best color I’ve ever seen in Utah. You can check out current pics that I posted on my Facebook page of the Alpine Loop and the Nebo Loop, all pics taken this week. Hope that helps! I love to do the very short hike to Buffalo Peak every fall. We just went today and the color was alright. In years past the color has been better but it was still enjoyable. You take the Squaw Peak Road and turn left instead of right to go to Squaw Peak overlook. That is a great hike, but I’ve never done it in the fall. I’ll have to make it back up there! It can be so hard to time the leaves changing at the right time and I am surprised this year by how many of the trees are already bare up that canyon!